In the Blue Line yards on Friday, a new Kinkisharyo train (at left) sits next to a train made up of the Nippon Sharyo P865 cars. Photo by Steve Hymon/Metro. Interior of the new Kinkisharyo light rail vehicle. Photo by Steve Hymon/Metro. An old P865 vehicle that has been taken out of commission and is being stripped for parts to be used to help maintain the rest of the P865 fleet. Photo by Steve Hymon/Metro. Interior of the old P865 car seen in the photo above this one. Photo by Steve Hymon/Metro. 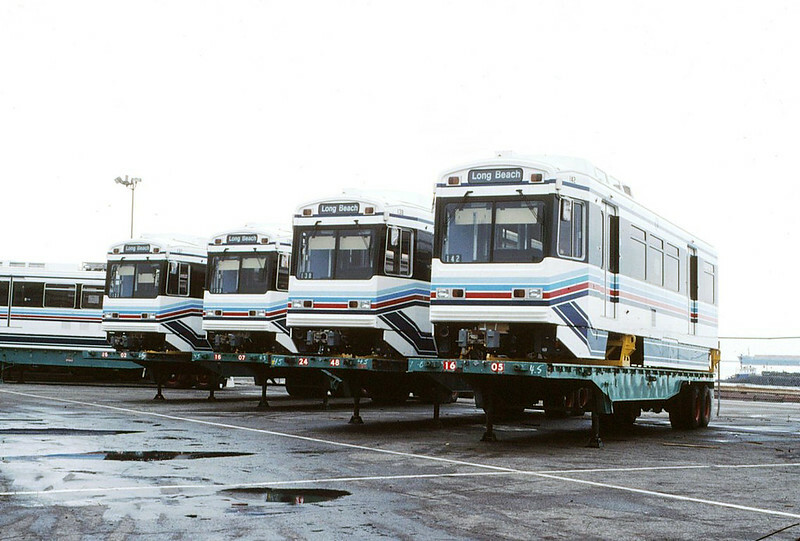 The old P865 cars en route from the port back in March 1989. Photo by Alan Weeks, via the Metro Library & Archive’s Flickr stream. More Blue Line pics in this album. 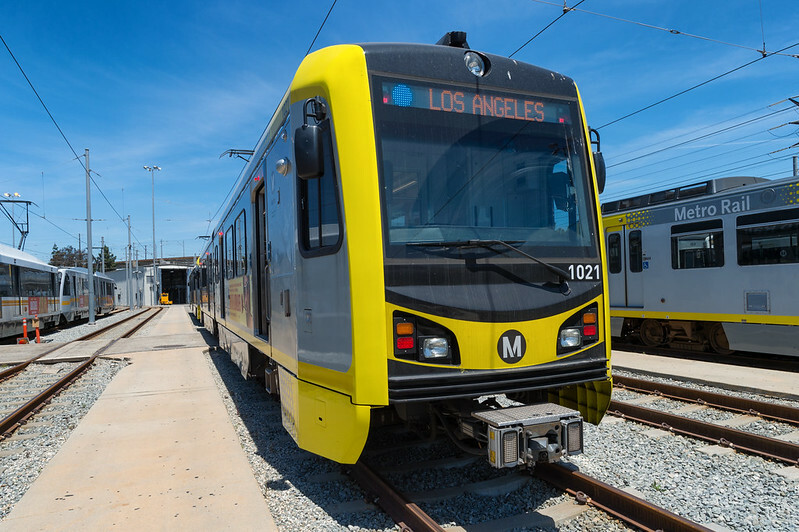 New rail cars are scheduled to begin rolling on the Blue Line on Monday morning (May 1). The Kinkisharyo P3010 cars have to date been used on the Gold Line and Expo Line, where they share track with older rail cars. Most of the rail cars used on the Blue Line date back to when the line opened or the mid 1990s. Most have well over one million miles on them. A single train of Kinkisharyo light rail cars is slated to debut tomorrow and will be followed by more in the coming weeks. 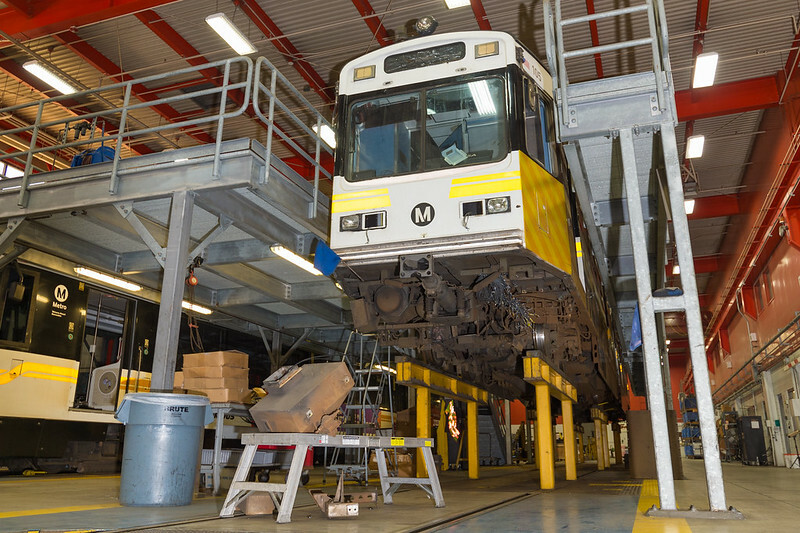 In the meantime, Metro has also retired one of the original trains used on the Blue Line — as you can see in the pics, it’s in the Division 11 Blue Line rail yards in Long Beach being stripped of useful parts. 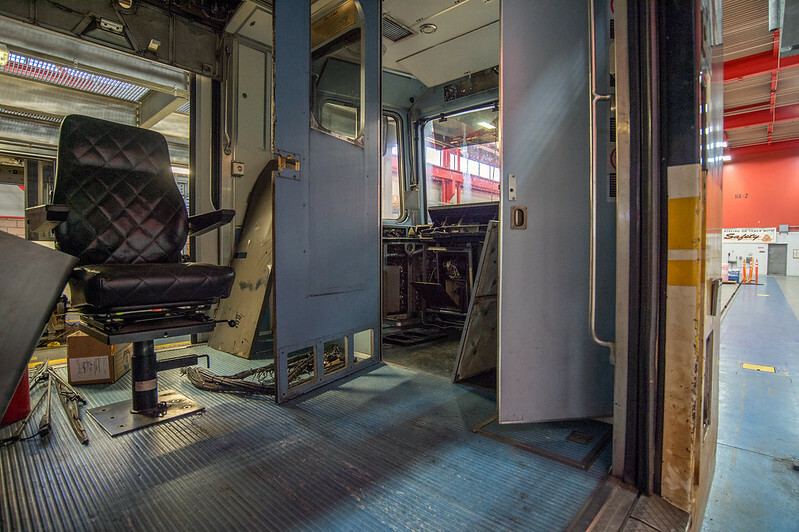 The goal is to retire the oldest rail cars by the end of 2018. Keep an eye out for the new Kinkisharyo train on the Blue Line Monday — and please share pics with us via Twitter or Instagram. The above pics and a few others can be downloaded from this album on our Flickr page. When will the last Nippon Sharyo P865 be taken out of service? And will there be a ceremony? I’ve spent a lot of time on those things. Me too Kenny! I ride the blue line all the time and have been getting increasingly jealous of the newer train sets on the expo and gold lines for a while now. Once all of the new railcars are in service, Metro should consider donating one of the old P865s to the Orange Empire Railroad museum for historic preservation. I think many readers of the source would agree with me that it was a sad mistake that more of the old red cars were not salvaged from the scrapyard for their now-obvious historical value. There’s a short line of track in San Pedro along the waterfront which, until a couple years ago, was operating two replicas and one restored original red car. It was taken out of service in anticipation of redevelopment plans for the Ports O’ Call, though, and so far there’s been no announcement of when they’ll return. Oh yeah I’m well aware of that, I’ve been pushing the city of Long Beach and Los Angeles City Councilman Joe Buscaino to invest some of the measure M local return allocation into a transit line connecting San Pedro & Wilmington with Downtown Long Beach and Naples. That’s because they won’t be returning. I hope Metro buys that and uses that RoW as a museum line. I spotted 2 train sets of these P3010s in a row at different times by chance. Can we please have 1 final Blue Line upgrade and bring Quadrant Gates to the 2 Long Beach railroad crossings and the remaining crossing towards LA. This could also stop high speed chase accidents as well as keeping the trains looking fresh instead of beat up when accidents acquire. I know some people who have road rage and will drive around gates. So … how does this effect the car shortage that leaves us stuck with two-car trains on the Expo Line at peak hours? I’m sure Metro would not retire cars if they weren’t worn out, but can’t the old ones be kept running until all daytime trains are three cars on Expo? I observed recently in San Diego that they place a older car between the new cars is each train set. But of course San Diego has kept their cars looking new thru the years. They donated one set to Orange Empire and it looks brand new. Yeah the ‘silver’ line in San Diego (an abridged loop circling the downtown core) uses legacy PCC streetcars on some of the same tracks as it’s modern fleet. I’d like to see the forthcoming $200 Million DTLA streetcar project mix in at least a few of the old old red cars to give the project some additional historic/tourism value, which would pair well with its proximity to Angels Flight. Angels Flight will at long last be reopening at some point this year. I’m talking about older San Diego light rail cars being combined with new cars in each train. Oh gotcha. Not sure what the logistical hurdles are for that but it’s clearly doable! That doesn’t make sense. But of course we are looking at an agency, the MTA, being ran largely by those who have no transportation experience and make decision based on text books as opposed to actual experience. The Blue Line recent track work is a prime example. The line was built using a non standard gauge which limited the type of MTA rail cars that could be used. While the Blue Line cars could be used on the Green Line and the Expo Line the reverse was not possible. The rebuilding of the Blue Line tracks was not the result of heavy usage but instead to re-lay the track from the non standard configuration to “Standard Gauge” as used on the other MTA rail lines. To issue specifications which must be met by bidders that failed to require new equipment be compatible with older equipment is pure stupidity and short sighted. That’s incorrect, the blue line was always standard gauge. You’re probably thinking of the Los Angeles Electric Railway (the yellow cars), which was a narrow gauge streetcar system. The Pacific Electric red cars, which ran on intercity routes such as those we now know as the blue and expo lines, was standard gauge. It can get confusing because they were both owned and operated by Henry Huntington for a while. Some sections of track, particularly in the street running sections immediately surrounding the old PE terminal at 6th & Main were shared by both red and yellow cars, and were thusly double-tracked. No. I’m not confusing the P.E and LARY with the Blue Line. The Blue was built to non-standard gauge specializations. I clearly remember when it opened and then the uproar over the Green Line Cars not being able to run on Blue Line Tracks since the Green Line was built to standard gauge as is the rest of the system. I remember when these bad boys still serviced the Green Line. What a time! Would the old Blue Line car be on garage sale or autioned ? I want to echo the question raised by Hans Laetz in his comment from 5:44 A.M. today, and add to it: Both the Expo Line and the Gold Line need more three-car trains during peak commuting hours. Several times last year, I and other Metro riders voiced our concerns here on TheSource about the need for longer trains to accommodate the increased number of riders on the Gold Line and Expo Line since both those lines were extended to include more stations. Metro personnel offered vague responses about how more Kinkisharyo trains were still arriving and being added, but at a very slow pace: one car per month, as I recall. Will the need for longer trains on the Gold Line and Expo Line ever be addressed? Respectfully, I recommend consulting with customer service for appropriate follow-up. I think it might be worth suggesting that folks in customer service and operations look through Source comments rather than relying on Source staff to be the middle man! People on this post seem to be under the misimpression that this means that the P865s are being retired, which is very much not the case. It says explicitly in the post that the one P865 being retired is being harvested for spare parts to keep the other ones running. You’re right, but I expect that similar actions will be taken with other P865 trains as the new fleet is delivered, so it wouldn’t be incorrect to say that this is probably the beginning of the end for the P865s. We’re these new cars made in Japan? Sounds like it. If so, why didn’t we buys cars made in the US? Oof that’s a beehive. Have you read ‘Railtown’? There was a whole big thing about that some years back. If I’m not mistaken, the cars are assembled at least in part by American workers now. Steve, care to chime in regarding ‘Buy America Act’ compliance? They are a Japanese company yes, but the Kinkisharyo rail is being built right here in the antelope valley (Palmdale). They are built from frame up. They are being assembled not built in Palmdale much like Toyota and other foreign built auto’s and trucks. Not exactly. My previous auto was a Japanese brand, but 85% of the parts were North American origin. It was manufactured in the US of A. I believe my current vehicle is similar. Brand name does not indicate origin. GM has plants around the globe, as does Toyota. Like these rail cars, the bodies and frames along with the engines and transmissions on autos are produced in their home country. Yes, G.M. and other makers produce cars in forign countries and their parts are made there because it is cheaper. The reason foreign auto’s are only assembled here is the import fees are lower for the individual parts than an entire auto. 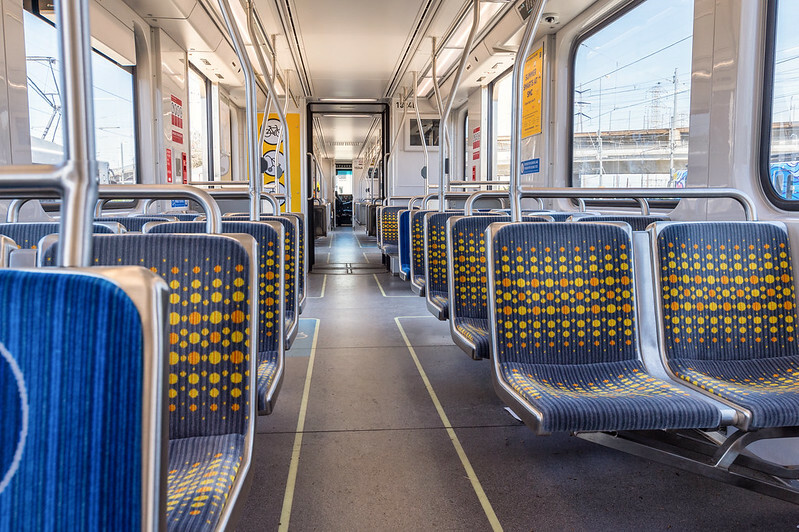 Do the new Kinki Sharyo trainsets have an open space for bicycles near a door or will cyclists be forced to squeeze themselves into the narrow articulated section as is currently the case? Any plans to make the existing trainsets less inconvenient and impractical for cyclists or people with strollers? Why again was Metro not able to use bicycle hooks like many other transit providers? Spotted a new Blue Line train today at 7th/Metro – just a suggestion: another color needs to be used on the Blue Line train signs – they are identical to the ones on the Expo Line and Metro workers had to yell out which line each train belonged to. Seems like it can be easily corrected and can save a lot of confusion down the road. 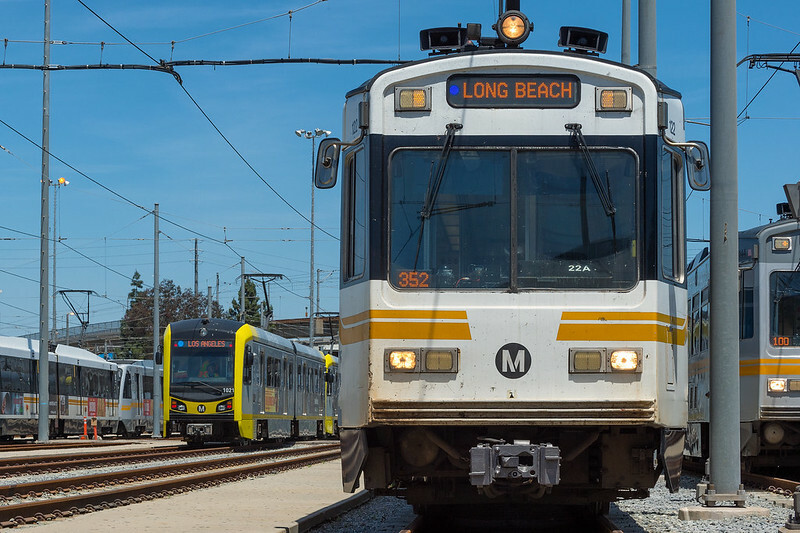 When the regional connector is completed that won’t be an issue anymore; The expo line will become part of a new gold line (from Santa Monica to East LA) and the section of the gold line to Azusa will become the northern leg of the blue line. So at 7th/Metro and Pico stations it will be Blue and Gold instead of blue and also blue (expo). The aqua color and name “expo line” will be retired at that time. From what I understand when the Regional Connector is completed the Pasadena section of the Gold Line will be physically severed from the East. L.A. section. That being said where are they going to store the excess cars in Santa Monica since that yard is at capacity now. Up until they added the Expo Line and it was ready for operation was there any discussion as to the potential operational problems at the Seventh and Flower Station. Except for a few RTD management holdovers most the decisions are made by text book bureaucrats who have little practical experience. Why don’t they put the trains that are scheduled for being pulled and use them on the weekend? The schedule on the weekend is AWFUL! The two car trains (Blue Line) are packed when they leave the start! Good luck getting on the train in the middle, and forget it if you’re with a bike. Let’s move the retiring cars to the weekend, yes? Man do I hate taking the train on the weekend! Uh, *what* light rail vehicles made in the US? I am pleased to hear there is “HOPE” after all coming very soon (7-days) to the Metro Blue Line. The current P865s cars are long past due for retirement. Thank you Metro for not completely forgetting about the Blue Line rail service. Hey I got an idea! How bout putting those car being retired to service on the weekends? I don’t think anyone knows the pain it is catching the Blue Line on the weekends. 2-car trains fill up at the beginning of the run makes it a pain for everyone. Feel sorry for the people trying to catch the train in the middle. Forget it if you’re rolling with a bike! I spotted it by chance today on the way home near the Florence Station. It was a shock to see it rolling on the blue line track.